Sometimes called Twenty-One, people all around the world love this game. Simple to learn and easy to play! All players get dealt two face up cards to begin. The dealer gets two cards but is dealt one face-down. The goal is to get a higher number than the dealer without going over 21! For example, if you have 19 and the dealer has 18, you’re going to win 1:1. If a player or the dealer goes over 21, that individual loses. If the dealer loses, all remaining players win 1:1. A player may choose to hit or stay on any number. To hit is to ask for another card. To stay or stand is to accept whatever number you have. The dealer must hit on all values of 16 or less and must stand on 17 or higher. Blackjack happens when a player or dealer reaches 21 on their first two cards (i.e. a King and an Ace) and pays either 3:2 or 2:1 depending on the chip denominations. A natural 21 will always beat a 21 obtained through hitting. 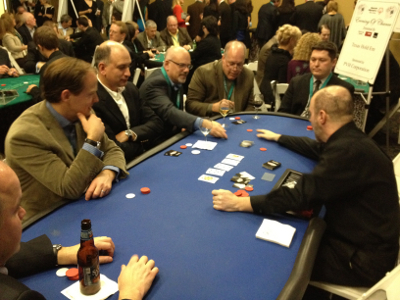 At a 10 table event, we recommend 4 Blackjack tables. With the highest payout in the entire casino (35:1), this is a very popular and exciting casino game! The players here can choose to play directly on numbers (1-36, plus 0 and 00) for 35:1 odds. They can also pick two adjacent numbers, called a split (e.g. 1 and 2 or 2 and 5), for 17:1 odds or 4 adjacent numbers, called a corner (e.g. 1, 2, 4, and 5) for 8:1 odds. There are a few other less common number bets but they will be easier to learn at the table – so be sure to ask your dealer! 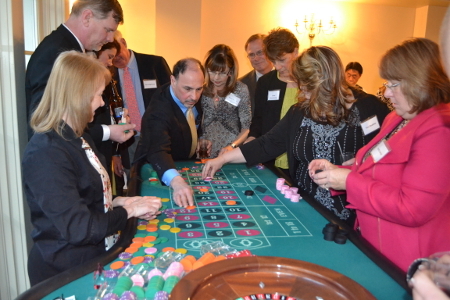 In addition to betting on numbers, players can bet on red/black, odd/even, and different sections on the board. All of these pay out either 2:1 or 1:1 depending on the specific bet. Again, ask your dealer for specifics! They are happy to teach you the ins and outs. 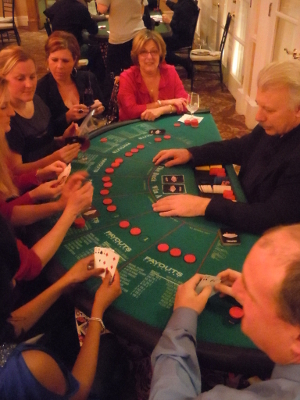 At a 10 table event, we recommend 2 Roulette tables. Often said to have the best odds in the casino, I know one thing for sure: this game is one-of-a-kind. Don't be intimidated! Step on up and learn it. Often scaring people away with its various options and two different “modes,” Craps is actually pretty straightfoward. Basically, there are two modes to the game: On and Off, indicated by the on/off black/white marker by the dealer. When the game is off (also referred to as the ‘come out roll’), players will usually just play the Pass Line. The Pass Line on the come out roll wins on a 7 or 11. It loses on a 2, 3, or 12 (those numbers are called ‘craps’). If any other number comes up during the come out roll, that number becomes the point and the game is set to On.Now you win when the point is rolled. You lose if a 7 comes up. This is the heart of Craps. There are plenty of other bets but once you understand the pass line, everything else is cake. Ask your dealer for help! You’ll master the game before you know it. 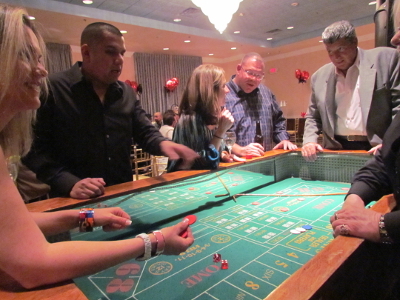 At a 10 table event, we recommend 1 Craps table. Quickly becoming one of the most popular games in the casino, this easy-to-learn game allows players to enjoy a new twist to the poker genre. As a three card version of poker, you only need 3 cards – instead of the usual five – to make hands like a Straight or a Flush. This also means, however, that some hands cannot be made (i.e. Full House and Four-of-a-Kind). Each of the players places an ante to receive their three cards. If they like what they have, they put up a ‘play bet’ to indicate they want to proceed with their hand. They also have the option of folding, but they will lose their ante. Once everyone has made their call, the dealer flips over his three cards. If the dealer does not have a Queen High or better, his hand doesn’t come into play. The player wins on the ante and pushes on the play bet. If the dealer’s hand does qualify, the winner is the one with the better hand. Note: The players are only playing against the dealer. If two players beat the dealer but one of them has a better hand than the other, both players still win. That makes this a much less competitive and stressful game compared to its Hold’em brother. 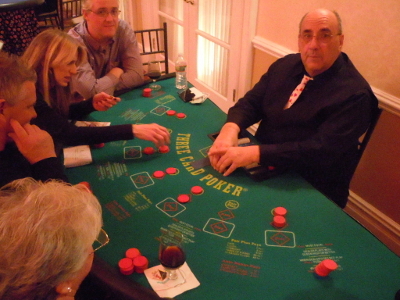 At a 10 table event, we recommend 2 poker tables (Hold'em, Three Card, and/or Let it Ride). This highly competitive poker game is a staple of any casino. It's the game-of-choice for professionals and well loved by all types of players. Every player is dealt 2 cards. Before seeing any other cards, they then place a bet or fold. 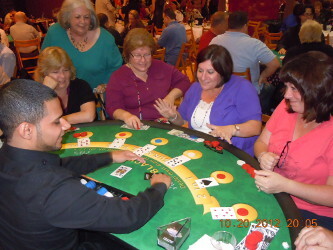 Once all players have had their chance to bet, the dealer flips over three cards – called the flop – and places them in the center of the table. These three cards are now in use by all the players. It is a shared pool of cards. The players have another round of bets and a 4th card is flipped. Another round of bets and a 5th card is flipped. Each player now has access to 7 cards (2 private in their hands, and 5 public on the table). The winner is the player with the best 5 cards (i.e. a full house will beat three of a kind). One final round of betting takes place and the remaining players show their cards to decide the winner. Players can enjoy this relaxing game with very little stress! Some may call this table game, "the solitaire of poker." All players put up three separate but equal bets and get three cards to make up their hand. The dealer puts two cards face down in front of himself. The players look at their hands and can decide whether or not to withdraw one of their bets or to let it ride. Once everyone has decided, the dealer flips one of his cards. Once again, players are able to withdraw one of their bets. Once this second round of “betting” is concluded, the dealer flips over his second card and the players show their hands. If someone has a pair of 10s or higher – using both the three cards in their own hands as well as the two cards infront of the dealer – they win 1:1. Two pairs (e.g. 2 Threes and 2 Fives) pays out 2:1. Each winning hand pays out relative to the odds of getting that hand. The payouts are described on the table but your dealer would be happy to answer your questions as well. 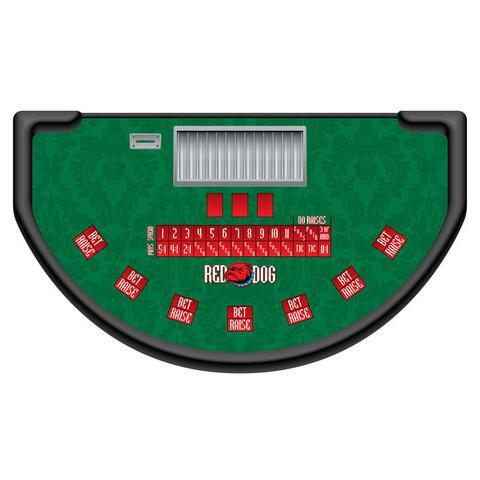 Perhaps the most visually exciting of any casino table, this game is easy to play and perfect for non-gamblers. Each player gets a play space with denominations of U.S. currency in a column: $1, $2, $5, and so on. There are also spots for the U.S. Flag and Joker. 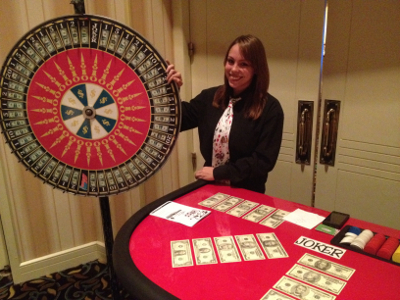 Players lay out their bets very similarly to roulette, and we spin the wheel! Whichever number comes out is the winner. The $1 pays out 1:1, the $2 pays out 2:1, the $5 pays out 5:1 and so on. The Flag and the Joker both pay out 45:1, making it the highest payout in the casino. 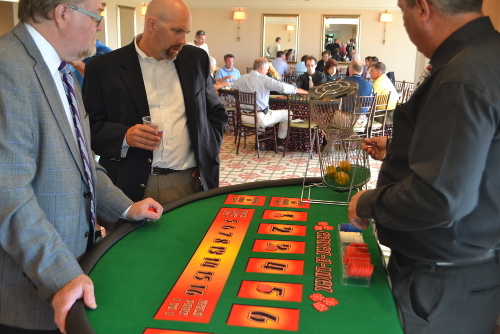 At a 10 table event, we recommend 1 Money Wheel or 1 Chuck-a-Luck. This brand new, unique table is simple and fun! It is also perfect for non-gamblers. At the core of this game, you are looking for triples! Winning with triple sixes will pay out 10:1. But there are other ways to play as well. There are two types of bets in this game: 1) betting on the sum of the dice and 2) betting on the individual dice. When betting on the sum of the dice, you can bet it will be odd, even, higher than, or less than 10, or any combination of the 4. Each of these will pay out 1:1. When you play on individual dice – say you bet on the 2 and the 6 – you are hoping that triples of either number comes out. If, for example, the dice read 2, 6, and 6, you will win 1:1 on the 2 and 2:1 on the 6 (since 6 came out twice). 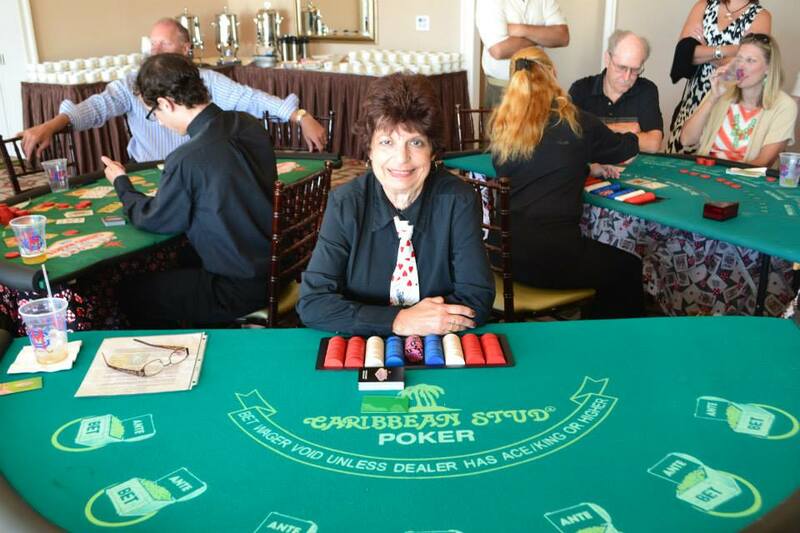 If you know the basics of five-card stud poker, you'll fit right in at the Caribbean Stud Poker table. Player makes an ante wager. Each player and the dealer get five cards each. All cards are dealt face down, except one dealer card is exposed. The player may examine his own cards but sharing of information is not allowed. Player must fold or raise. If player folds he forfeits his cards, ante bet. If player raises then he must make a raise wager exactly equal to twice the ante. The dealer will turn over his other four cards. The dealer must have an ace and a king or higher to qualify. In other words, the lowest qualifying hand would be ace, king, 4, 3, 2 and the highest non-qualifying hand would be ace, queen, jack, 10, 9. If the dealer does not qualify the player will win even money on his ante wager and the raise will push. If the dealer qualifies and beats the player, both ante and raise will lose. If the dealer qualifies and loses to the player, then the ante will pay even money and the raise according to the posted pay table. The U.S. pay table is shown below. If the player and dealer tie, both ante and raise will push. Red dog, also known as red dog poker or yablon, is a game of chance played with cards. It is a variation of acey-deucey or in-between.